Mixed media pieces combine a variety of materials with fibre and stitch and may involve paper, paint, digital imaging and materials altered by heat depending on the piece. I enjoy the immediacy of many of these techniques. For example in the Northumbrian Inspirations series I enjoy layering the wool and silk fibres to create the landscape backgrounds intuitively and the way they combine to produce the colours and effects I am seeking. 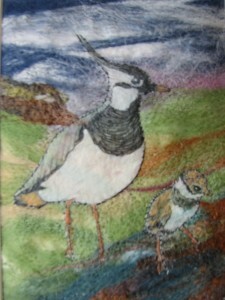 One of my ‘Northumbrian Inspirations’ series, this lapwing and chick are painted on vellum and stitched to a needle felted background of wool and silk fibres. Each of these pieces are unique but I can create one in the same style featuring the bird of your choice in an appropriate setting just for you.